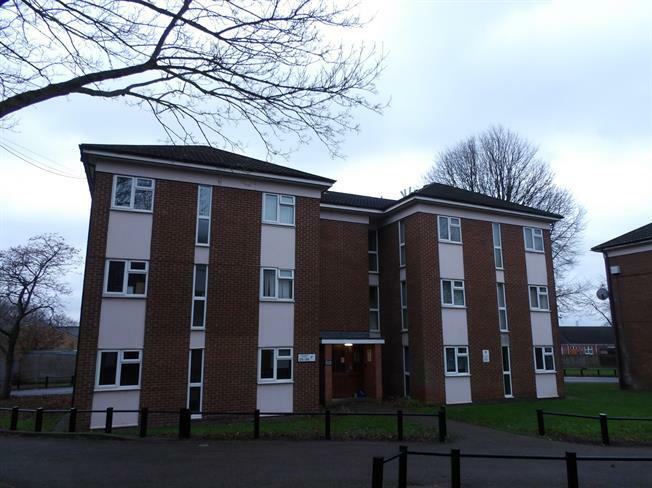 1 Bedroom Flat For Sale in Nottingham for Asking Price £70,000. One bedroom second floor flat which has a lease of 125 years from 1989. The property benefits from double glazing, gas central heating and is being sold with no upward chain. The accommodation comprises communal entrance hall with intercom system, stairs to second floor, entrance hall, lounge, fitted kitchen, double bedroom, bathroom, storage area. No Chain. Intercom system, stairs to second floor. Front door. Double glazed uPVC window facing the front. Radiator, laminate flooring. Double aspect double glazed uPVC windows facing the front and side. Radiator, laminate flooring. Double glazed uPVC window facing the side. Radiator, built-in storage cupboard, part tiled walls. Roll edge work surface, wall, base and drawer units, one and a half bowl sink, electric oven, electric hob, space for washing machine. Double bedroom; double aspect double glazed uPVC windows facing the front and side. Laminate flooring, a built-in wardrobe. Radiator, laminate flooring, built-in storage cupboard, part tiled walls. Low level WC, panelled bath, electric shower, pedestal sink.